Being as I'm not exactly generating much new content these days,* I figured I'd go through my stats and see why it is that people actually still find their way over here. There are a few search terms that dominate my blog statistics; consider this a cheat sheet to my most sought after posts (and then please explain to me why oh why some of these have had this much longevity!). 1) [insert creepy skinny male runner] shirtless/naked: Galen Rupp, Mo Farah, Ryan Hall - ladies (and I'm sure some dudes) are looking for eye candy. Glad I could help, even if most of us are scarred (rather than turned on) by these images. NB: Sage Canaday shirtless is not creepy. Sage Canaday shirtless is a present. 2) running skirts: Yes, I still wear them, although I've also introduced a couple of pairs of shorts into the repertoire. I like shorts and always have, I just don't like that they never fit me well. Skirts are my jam; skirts are reliable and work for me. Because the last thing I want to be thinking about when I'm running is my shorts riding up. 3) low ferritin and running: I've struggled with my iron levels for a while now. I get tired and lethargic, so I go to the doctor and she tells me to take iron; a few weeks later I feel better and she tells me that my levels are up and that I should stop; a few months later I feel tired and lethargic again... At present I have it mostly under control, which is to say that I've chosen not to go to the doctor about it and am instead dealing with it by mostly forgetting to take my iron pills and just complaining, loudly, about why I'm always so tired. Hey, my doctor is in Harlem still, and since I moved to Brooklyn, that means like 3 hours round trip. And don't suggest I switch doctors - I love her to pieces. I'm just saving up problems so I can hit her with a long list when I finally make the trip. 4) port a potty: Yes, yes, last year I had a very annoying race that devolved into a run-in (ha ha, "run" in, get it? triple entendre!) with a port a potty. And I blogged about it. And a full year later, people still find my blog looking for info about port a potties. 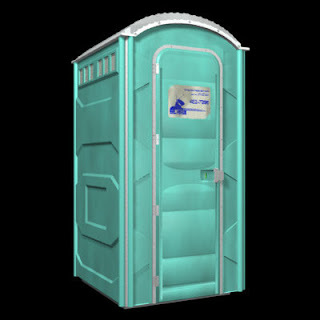 And truth be told, I'm not entirely sure I've even used another port a potty since then. And you people can be kind of creepy. **Actually I have a lot to say, but most of it is either mean-spirited, totally personal***, or depressing. ***I really, really hate when bloggers are all, "There's so much going on, but I'm not really comfortable sharing it with the blog!" Here's something novel: then just don't share it. We don't know what you don't tell us. That said, there's so much going on in my life right now, but I'm not really comfortable sharing it with the blog! Your disclaimers cracked me up today. But... now I want to know what's going on! Haha! Honestly, it's nothing exciting. Just some work stuff going on, and also I'm a single lady who tries every now and then to date.